Facebook Inc. co-founder Mark Zuckerberg is poised to leapfrog Warren Buffett to become the world’s third-richest person. Zuckerberg, more than a half-century younger than the Berkshire Hathaway Inc. chairman, is now worth US$81.3 billion, gaining US$8.5 billion this year as Facebook shook off a data-privacy crisis that caused its stock to tumble 18 per cent. 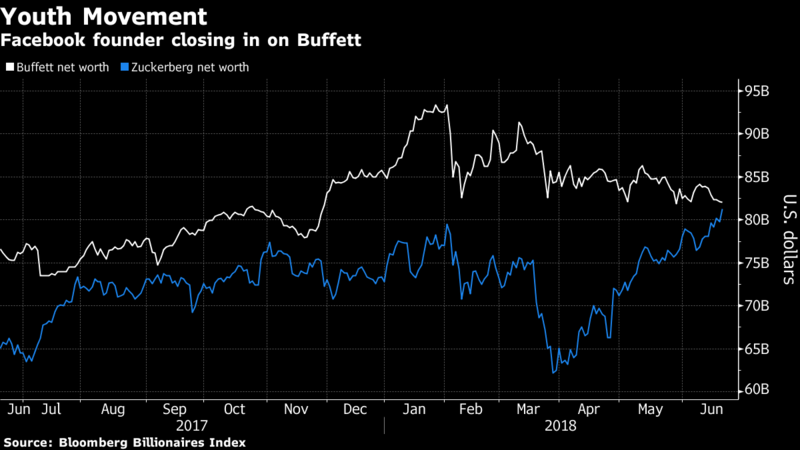 Its rebound from a closing low of US$152.22 on March 27 to a record $201.45 at 9:45 a.m. Wednesday in New York narrowed the gap with Buffett to US$725 million, according to the Bloomberg Billionaires Index. The recovery in Facebook shares has rewarded other insiders as well, including Chief Operating Officer Sheryl Sandberg, who’s now worth $1.8 billion, and Chief Technology Officer Michael Schroepfer, whose 0.05 percent holding is valued at US$224 million. Zuckerberg, 34, also trails Amazon.com Inc. founder Jeff Bezos, the world’s richest person with a us$143.6 billion fortune through Tuesday, and Microsoft Corp. co-founder Bill Gates, with US$92.7 billion. The Bloomberg index ranks the world’s 500 richest people and is updated after the close of each trading day in New York.